The ‘Your Life Talks’ website is comprised of various web pages operated by the IOS Trust ABN: 39 784 679 497 trading as Independent Online Services Pty Ltd. The ‘Your Life Talks’ Website is offered to you conditioned on your acceptance without modification of the terms, conditions, and notices contained herein. Your use of the ‘Your Life Talks’ Website constitutes your agreement to all such terms, conditions, and notices. The primary purpose of this site is to provide the general public with products and information regarding the practicalities of putting your affairs in order, end of life care wishes, death, funerals and the aftermath, and to give the opportunity to find relevant products and services to assist with having the necessary conversations with your loved ones, regarding any of the above matters. While a great deal of care has been taken to keep any legal information on this site both accurate and current, due to constantly changing laws Your Life Talks does not guarantee the validity of the information supplied. Nor can it be held responsible for errors, misprints, omissions or misinformation. Your Life Talks is not responsible for information that may be contained in sites linked to Your Life Talks, or links to other sites provided by anyone listed in Your Life Talks. Your Life Talks is not a substitute for competent professional legal, financial and counselling advice. 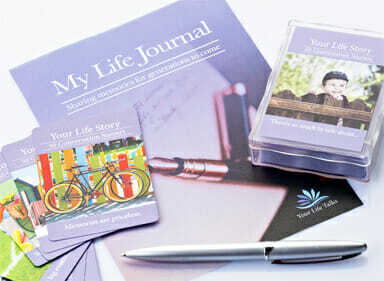 All copyrights, trademarks and intellectual property rights on the Your Life Talks Website belongs to Your Life Talks. Logos, images and names identifying Your Life Talks products are proprietary marks of Your Life Talks and except for what is listed below, shall not be construed as conferring license or right by implication or otherwise for use except where Your Life Talks permission has been granted. The public is granted nonexclusive, non-transferrable limited license to view and use information retrieved from the Your Life Talks database and site as long as it is solely for personal informational, non-commercial use, and furthermore that any copyright notices or any notices are not removed, obscured or changed. No part of this site including but not restricted to materials retrieved from it, its source code or images on it, may be reproduced, copied, republished, transmitted or reproduced in any form whatsoever, except where stated in this Terms and Conditions statement or where permission has been granted by Your Life Talks. Your Life Talks expressly disclaims all warranties, including the warranties of merchantability, fitness for a particular purpose and non-infringement. e. Your use of any products, equipment or software in connection with this site. A covered party (covered party being: the IOS Trust, its affiliates, any officers, members, employees, subcontractors, agents, successors) shall not be liable for any direct, indirect, incidental, special or consequential damages of any kind whatsoever (including, without any limitation, attorneys fees and or lost profits or savings) in any way due to, resulting from, or arising in connection with this site, including its content, regardless of any negligence of any covered party. The terms and conditions that have been set forth shall be governed and construed in accordance with the laws of Australia and any disputes arising shall be exclusively subject to the jurisdiction of the courts of Australia as they apply to agreements made and solely performed therein. The Your Life Talks Website, its source code and these Terms and Conditions are subject to change without notice. The continued use of the Your Life Talks site following any change constitutes your acceptance of the change. Please review this section for any major changes in the future. These Terms and Conditions incorporate by reference any notices contained on the Website and constitute the entire agreement with respect to your access to and use of www.yourlifetalks.com. If, however, there are any provisions set forth in these Terms and Conditions that are unlawful, void or unenforceable, then that particular provision will be deemed severable from any of the provisions remaining, and shall in no way affect the enforceability and validity of said provision. Any rights not expressly granted herein are reserved. Should you be dissatisfied with any portion of Your Life Talks Website, or should you not agree with these Terms and Conditions in full, we request that you discontinue using the Your Life Talks Website. AGREEMENT BETWEEN Business Advertisers/Suppliers AND Independent Online Services Pty Ltd. The IOS Trust (ABN: 39 784 679 497) trading as Independent Online Services Pty Ltd, owns and operates the Website and content known as Your Life Talks. All advertising fees payable to Independent Online Services Pty Ltd pursuant to these Terms and Conditions are the quoted rates advised to you on the website or via written correspondence after negotiations between both parties. We reserve the right to increase our fees and we will notify you of any fee increases. Advertising Fees are inclusive of GST. Independent Online Services Pty Ltd will provide you with a tax invoice for the advertising fees plus applicable GST when an advertising fee is paid. You must pay all agreed payments in full before your advertising goes online. If your account is overdue for any subsequent extended period, we have the right to take your advertisement offline until we have received all outstanding moneys. exercise any other rights available to Independent Online Services Pty Ltd at law. Your Life Talks may terminate your advertising and remove your banner from the website at any time during the advertising period and for any reason. Your Life Talks is not obliged to provide you with reasons for terminating your advertising with us. If Your Life Talks terminates your advertising during the advertising period and you have paid the advertising fees upfront and are otherwise not in breach of these Terms and Conditions, Your Life Talks will refund you a pro rata portion of the advertising fees applicable to the unused part of the designated period. If Your Life Talks removes your advertising banner from the Website during an advertising period pursuant to our content suitability clause of these Terms and Conditions, you agree that you will not be entitled to a refund of any amounts paid in respect of the advertising during the advertising period. If you cancel your advertising with Your Life Talks during an advertising period and you have paid the advertising fees upfront, you will not be entitled to a refund of any amounts paid in respect of the advertising during an advertising period. This also relates to future extension period fees. If you cancel your advertising with Your Life Talks during an advertising period, the advertising fees payable by you for the unused part of the period will be returned to you on a pro-rata basis within 7 days. You may withdraw your advertising at any time by giving 7 days’ written notice to Your Life Talks, and your banner will be removed from the website at the expiry of the 7 days’ notice period. Your Life Talks is under no obligation to accept your advertising (or any part of your banner/text/images) for publication on the website and is under no obligation to provide reasons for such refusal. remove all or part of your advertising from the Website. In addition, Your Life Talks shall have the absolute right, without providing any reason, to reject any URL link embodied within your advertising. Images supplied to Your Life Talks for publication on the Website may be published on different pages within the Website, to be determined by Your Life Talks’ sole discretion. By submitting images to Your Life Talks, you agree that Your Life Talks may use your images anywhere within the Website. You agree that Your Life Talks may source images for your advertising directly from your website, if the images supplied by you are not suitable and you warrant that Your Life Talks is entitled to do so without infringing any intellectual property rights. Such material will be deemed to be submitted or supplied by you for the purpose of these Terms and Conditions. If Your Life Talks receives complaints from visitors to the Website in relation to a Supplier or Advertiser, Your Life Talks may, without notice to the Supplier, remove the relevant Supplier’s advertisement (or the offending part) from the Website immediately, and if this occurs during an advertising period and you have paid your advertising fees upfront, you agree that you will not be entitled to a refund of any amounts paid in respect of the advertisement during the period. Your Life Talks reserves the right to amend, move or reposition your advertisement or change the Website at any time. Your Life Talks will use its reasonable endeavours to give you advance notice of any material changes that it makes to the Website. you believe your advertisement has not resulted in the number of enquiries you expected to receive as a result of the advertisement on the Website. Your Life Talks owns all intellectual property rights on the Website, including information, graphics, design and software, except where the Supplier has provided its own intellectual property (including but not limited to text, graphics and pictures in whatever form), for display on the website. You must obtain the permission from the owner of any intellectual property in any third party material incorporated into your advertisement prior to submission to our Website. You grant Your Life Talks a world-wide, royalty free, irrevocable licence to publish, and to sub-licence the publication of, all material submitted to Your Life Talks as part of the advertisement in any form or medium, including print, online or otherwise. You warrant that you are authorised to grant the licence in this clause. comprise anything which may adversely reflect on Your Life Talks or the Website. Your Life Talks expressly excludes all liability for special, indirect or consequential loss or damage, including without limitation, loss of profits, loss of revenue, loss of income, loss of use, loss of business opportunity, loss of production, loss of anticipated savings, pure economic loss, loss of or damage to reputation or goodwill, or loss or damage associated with the interruption of the Supplier’s business, howsoever caused. breach by the Supplier of any laws or legal obligations, including the Competition and Consumer Act 2010, any state-based Fair Trading legislation. Your Life Talks may in future maintain a review system on the Website that allows consumers who use the Website to rate and/or review Suppliers’ online stores, products, goods and services and customer service. Your Life Talks is not responsible or liable to the Supplier or any third party for any loss or damage caused by such reviews. These Terms and Conditions are governed by and construed in accordance with the laws of Queensland, Australia and the parties irrevocably submit to the courts of or in that State (including the Federal Courts) and the courts that hear appeals from those courts. The Supplier may not transfer or assign these Terms and Conditions without the prior written consent of Your Life Talks, which consent may be withheld at the absolute discretion of Your Life Talks and if granted, may be granted on such terms and conditions as Your Life Talks deems fit. Any notice required to be given under these Terms and Conditions must be in writing and given by post, facsimile, email or hand to Your Life Talks or the Supplier at the contact details notified by one party to the other. No waiver by Your Life Talks of any breach of these Terms and Conditions operates as a waiver of any other breach, and the doing and/or omission of any act, matter or thing whatsoever by Your Life Talks, its employees or agents (which but for this clause ought or might amount to a waiver of Your Life Talks’ rights in respect of any such breach or default) does not operate as a waiver in any way of Your Life Talks’ rights and powers in respect of such breach or default. We pride ourselves on being flexible and innovative to do business with and we assure you of the best levels of customer service reasonably possible. If you have any queries regarding our advertising services or our Terms and Conditions, please contact us. We look forward to working with you.